(Nanowerk News) A new image released today reveals how Gemini Observatory's most advanced adaptive optics (AO) system will help astronomers study the universe with an unprecedented level of clarity and detail by removing distortions due to the Earth's atmosphere. The photo, featuring an area on the outskirts of the famous Orion Nebula, illustrates the instrument's significant advancements over previous-generation AO systems. "The combination of a constellation of five laser guide stars with multiple deformable mirrors allows us to expand significantly on what has previously been possible using adaptive optics in astronomy," said Benoit Neichel, who currently leads this adaptive optics program for Gemini. "For years our team has focused on developing this system, and to see this magnificent image, just hinting at its scientific potential, made our nights on the mountain - while most folks were celebrating the New Year's holiday - the best celebration ever!" The new system, called GeMS, is installed on the Gemini South telescope in Chile and is the first of its kind to use laser guide stars and a technology called Multi-Conjugate Adaptive Optics (MCAO) to image the sky. Motivated by MCAO's potential to produce a significantly larger field-of-view and more uniform corrections than previous AO systems, former Gemini scientist François Rigaut (now at the Australian National University), first suggested the system's development at Gemini over 10 years ago. According to Rigaut, "It's a great feeling to see this system on the sky and doing cutting-edge science. When it's all theoretical you dream of what it will someday do to improve our vision of the cosmos. An image like this makes it so real - it's worth all the mental sweat!" "Adaptive optics allows ground-based telescopes to take full advantage of their large mirrors," notes Dr. Gary Schmidt, Gemini program director for the U.S. National Science Foundation. "Gemini's development of MCAO leads the world, and its fidelity even surpasses that of current – and far more expensive – orbiting observatories for imaging the sky." This image, obtained during the late commissioning phase of the GeMS adaptive optics system, with the Gemini South AO Imager (GSAOI) on the night of Dec. 28, 2012, reveals exquisite details in the outskirts of the Orion Nebula. The large adaptive optics field-of-view (85 arcseconds across) demonstrates the system's extreme resolution and uniform correction across the entire field. The three filters used for this composite color image include [Fe II], H2, and, K(short)-continuum (2.093 microns) for blue, orange, and white layers respectively. The natural seeing while these data were taken ranged from about 0.8 to 1.1 arcseconds, with AO corrected images ranging from 0.084 to 0.103 arcsecond. Each filter had a total integration (exposure) of 600 seconds. In this image, the blue spots are clouds of gaseous iron "bullets" being propelled at supersonic speeds from a region of massive star formation outside, and below, this image's field-of-view. As these "bullets" pass through neutral hydrogen gas it heats up the hydrogen and produces the pillars that trace the passage of the iron clouds. Principal Investigator(s): John Bally and Adam Ginsberg, University of Colorado and the GeMS/GSAOI commissioning team; Data processing/reduction: Rodrigo Carrasco, Gemini Observatory; Color image composite: Travis Rector, University of Alaska Anchorage. This milestone also bodes well for future generations of large ground-based telescopes. "As telescopes get larger they look through more and more of the Earth's atmosphere and this is a problem," said Gary Sanders, Project Manager of the 30-Meter Telescope (TMT) Project. Sanders emphasizes that it is imperative that we find new and innovative ways to solve this problem by removing the distortions caused by the turbulent air overhead. "MCAO is a key technology that makes the next generation of large telescopes, like the TMT, justifiable. It allows us to use the light we collect more efficiently and see the universe more sharply than ever before in human history," said Sanders. About five years ago, when GeMS was under development, and still just a vision for Rigaut and the team, Gemini Observatory released an image of a smaller section of this area of the Orion Nebula known as the "Orion Bullets." That image demonstrated the power of Gemini's AO system called Altair - which is still actively used at the Gemini North telescope. Gemini's instrument scientist for Altair, Chad Trujillo, points out that in one shot GeMS covers a significantly larger field-of-view than Altair and, he adds, "The uniformity and performance across the image is amazing! In this new image, the pixels are 2.5 times finer and there are about 16 times more of them. Both the correction quality and the field-of-view are considerably better than the previous generation of AO systems." The technology behind MCAO involves the use of multiple laser guide stars (five in the GeMS system) and several deformable mirrors (three in all) to sample atmospheric distortions and cancel them out in real-time as imaging data is collected. Using algorithms similar to those developed for medical tomographic imaging the GeMS MCAO system creates a three-dimensional snapshot of atmospheric turbulence about 500 to 1000 times per second. The result is about a 16-fold increase in the patch of sky observed, while providing uniform corrections over the entire field. "This is huge when it's time for astronomers to reduce their data," said Adam Ginsburg a graduate student working with John Bally at the University of Colorado who originally proposed that the GeMS system revisit the Orion bullets. "If the corrections are not uniform across the entire field it is difficult, and sometimes impossible, for researchers to compare one part of a dataset with another and errors proliferate," said Ginsbrug. Bally adds that MCAO should make this problem a non-issue. GeMS, in conjunction with the Gemini South Adaptive Optics Imager (GSAOI), is undergoing commissioning and has obtained some early System Verification data. About 80 hours have been offered for the first semester of 2013, and more will be available in the second semester, for astronomers in the international partnership through the standard Gemini proposal process. Discovered in 1983, the Orion Bullets are clumps of gas ejected from deep within the Orion Nebula - located some 1500 light-years from our Solar System. The violence causing this is likely related to the recent formation of a cluster of massive stars with strong winds that can expel gas at supersonic speeds. The bullets (seen as distinctive blue features in the new Gemini image) are actually quite large, about 10 times the size of Pluto's orbit around the Sun. 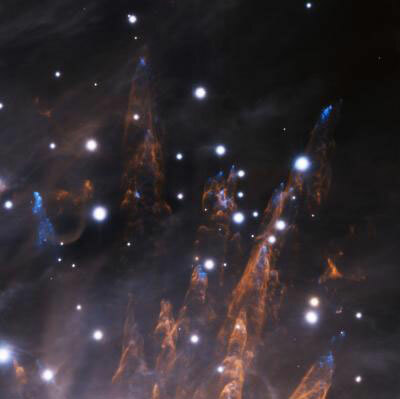 As the bullets speed outward, they leave behind distinctive tubular and cone-shaped wakes, which shine like tracers due to the bullets heating of the molecular hydrogen gas in the Orion Nebula. The wakes span much greater distances than the bullets, measuring as much as a fifth of a light-year in length. As Gemini first observed with Altair, the fingerlike wakes also resolve into filaments which are clearly resolved in the new Gemini GeMS image.